Familiarise yourself with the veterinary media: Do you know how many veterinary magazines there are? How many are monthly and how many are weekly? Which are aimed at vets and which at vet nurses? Do you know the favoured online sources of veterinary news? 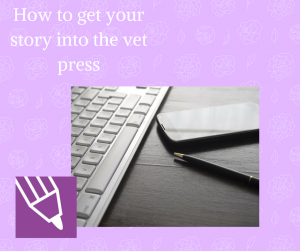 Before you start sending them press releases, make sure you know ‘who’s who’ in the veterinary media world. It will enable you to target more accurately and to achieve greater success. Build relationships: In media relations, ‘relations’ matter. Drop an email to your key veterinary titles. Introduce yourself. Ask them what types of story they’re most interested in and find out their copy deadlines – journalists’ lives are ruled by deadlines. Once you’ve started to build a relationship, you’ll be able to send them the type of stories they are most likely to cover – and they will recognise your name and be more likely to open your emails.